Saturday evening, I went out to check the early pears. Not only had the pears gained in size over the week, but about half were almost ripe enough to eat right off the tree, the other half could be picked and stored in the fridge, until we are ready for them (then ripened on the counter for a couple of days). Two pears had already fallen from the tree. It looked as if they'd been on the ground for about 2 days or so. I washed them, cut off the bad spots, and used in a fruit salad with dinner. Sunday, late afternoon, my daughters and I picked the tree. I only had one pear so high up that I needed to use the pear picker. We call this model, "Pear Picker 3.0" It's an improvement over "Pear Picker 2000", in that no duct tape was needed (which was a good thing, as we are out of duct tape at the moment). I turn a portable, tall sprinkler upside down and stuck the spike-end into the bottom of a used coffee cup (from church). 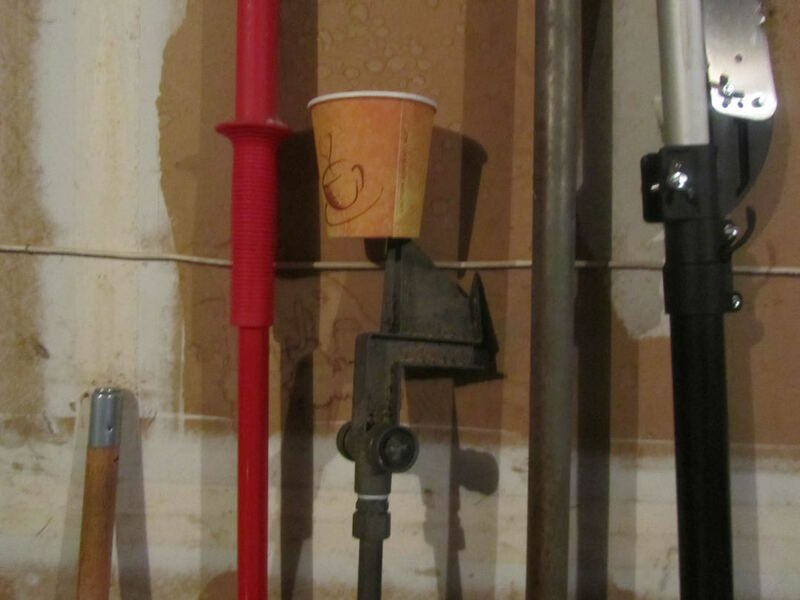 The coffee cup was secure on the spike and just the right size to hold 1 pear at a time, from the safety of a lower rung of the ladder. Pear Picker 3.0 did the job. I was able to reach that highest pear, gently push up on the pear, break the stem and lower the Pear Picker (with pear in the cup) to safety! Only one pear was dropped in the entire harvest, which is an improvement for me. That pear is resting on the counter, ripening, and will be used in a smoothie or yogurt later this week. We harvested over 50 pears from this tree, this year. That's enough to last the entire month of August, and maybe into September. I love these pears. They look so beautiful, have a soft skin, are super sweet, and are an early fruit. I'm envious! What a bounty! Do you home can our freeze any for Winter? I've frozen these pears in light syrup before. This year, though, they'll be used fresh. These pears will keep in the fridge for about a month. 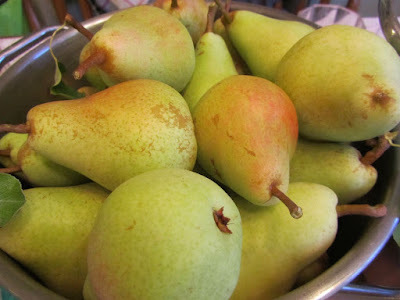 We have a later-bearing pear tree which has long-keeping pears, which keep until about January 1, in the fridge. In your "forever" home, maybe you'll add fruit trees? These are Morettini pears. I chose this variety for their earliness and productivity. As a bonus, they haven't had any disease problems. I'm not sure if their of the d'Anjou type or not, but they do have the same characteristics. Our other producing pear tree is a Conference, with the russeted skin, and is ready in fall. We have 2 more pear trees, just not in production yet, hopefully next year they will begin fruiting. I had been contemplating buying an apple/pear picking tool, but this worked just as well, saved money, and I didn't have to run out to Home Depot. The pears are beautiful. Do you have to do much to keep away insects and birds (and squirrels) which are the bane of fruit trees? The pear trees don't seem to attract the pests like the cherry or apple trees. I don't know if that's due to where we've planted the pears vs. the rest of the fruit trees (the pears are in an ornamental garden in the front yard, whereas the other fruit trees are clustered somewhat in the food gardens), or pears just don't attract pests? Squirrels and blackbirds are the worst of the pests, and for cherries and plums we do have a worm that some years is bad in the trees. When we began planting fruit trees, we really didn't know which fruits would do very well, here. I'm happy to find out that pears do very well, as they are always around $1/pound, at the cheapest in the stores. Wow what a bounty!! Your pears look so delicious. I especially envy the many fruit trees in your property, such a big money saver. We have only one fruit tree, pomelo, and no one eats it (statins). I forgot to mention...we do have a fledgling papaya tree that gave some much needed fruits when the markets were completely without. I've regretted not planting more fruit trees 20 years ago, now it is too late. So the sturdy greens being produced in pots will have to do for now. When you first mentioned Kang Kong, I'd never heard of it, so I had to wiki it to find out what it is. I'm guessing you use it in stir-fries and soups? I read that it's highly nutritious. And homegrown papaya sounds so yummy! Papaya is a rare treat here. I used to ask for and get it on Mother's Day for breakfast in bed. Do you give your pomelos to anyone, or a food bank? I lost my earlier comment by hitting the back arrow on my kindle, mistaking it for the "delete" key lol I wish our pomelo fruit looked half way decent. It is odd shaped and thick skinned, so on first glance it is not a nice fruit to giveaway. But the taste is wonderful, like a very sweet grapefruit. We just let my father do what he wanted with the tree. He is not on statins so he can eat it. But lately he's not wanting to eat it. He says I let it sit too long after being picked so it doesn't taste good. Slowly he's improving and has regained his ability to sit, stand and do limited amount of walking. We finally got an MRI done and seen a neurologist who cited a laundry list of problems with his spine, at least 4 big issues that could have caused his pinched nerves. The worst being a compression fracture, bone spurs, disc bulge and stenosis in almost every lower back vertebra. Sorry for elaborating so much about this on your blog, but I wanted to tell you how much he's improved and thank you so much for your prayers and concern. Kangkong also is another food source that is difficult to acquire. I love it, but had it not been for the East West Center professor who gave a talk about the nutritive quality of this vegetable 40 years ago, I wouldn't have given this vegetable a second look. His main points were one of the most nutritious and easy to grow...wow just the right garden vegetable for me. It's sold everywhere in our farmer's market and supermarkets locally because it is used in many Asian style dishes. It tastes almost like a spinach, and lately I've been blanching/freezing it and eating it plain with a little dressing. We sometimes stir fry it with Chinese black beans and that of course is my favorite, but how many times can we eat it that way? So freezing it is a convenient option. YHF, I'm glad to hear your dad is making improvements, albeit slowly. Hope you enjoy all your pears. That is a nice harvest from just one tree. Hopefully my trees will be mature enough to begin producing next year. I hope your fruit trees give you a bountiful harvest, year after year! What do you have planted? My mom used to make a pear and lemon jello salad. With cottage cheese would be delicious, too! Wow those pears look so yummy. I love your pear picker! These pairs are sweet and juicy. I do realize just how fortunate we are!